Much like Gordon Freeman, the Team Fortress 2 cast has been one of those figures I thought should have come out years ago. 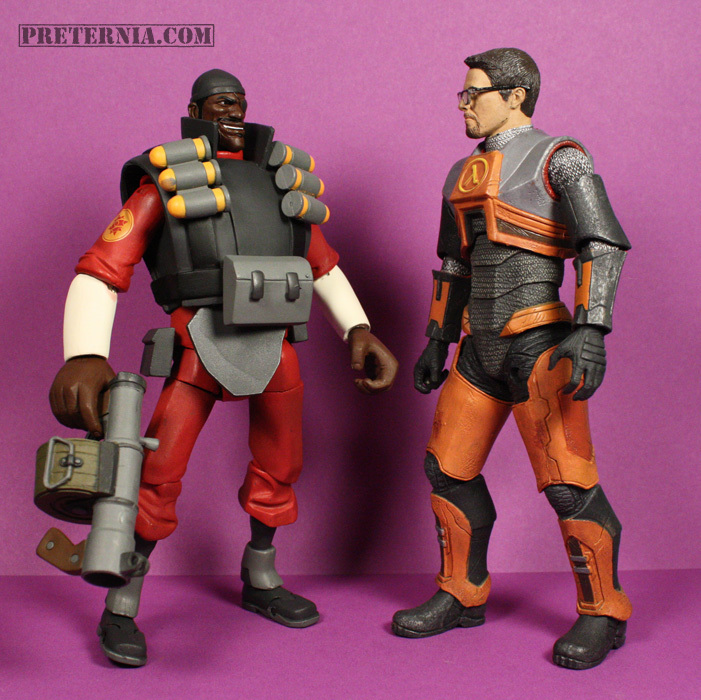 I’d even go as far as to say I’d expected TF2 figures before Gordon Freeman even, the cartoon style lends itself well to a toy or if nothing else a PVC figure. 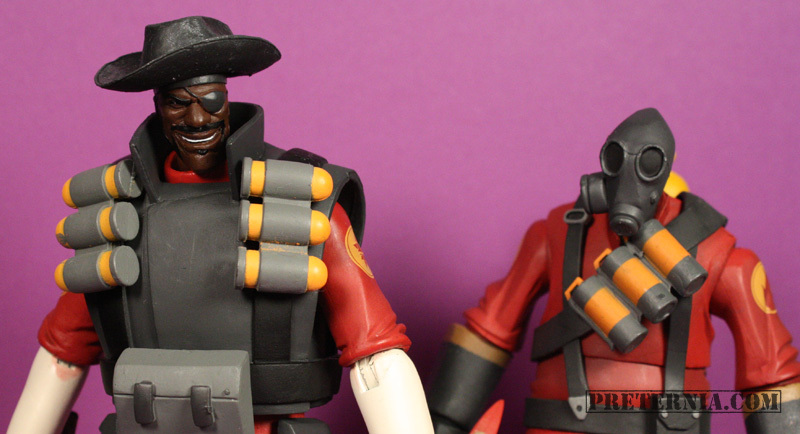 I’m almost positive we first saw the Pyro and Demoman for the first time at Toy Fair 2012, so it has been about a year from announcement to release. These figures look awesome, in fact they look ripped right from the game. So were they worth the wait? 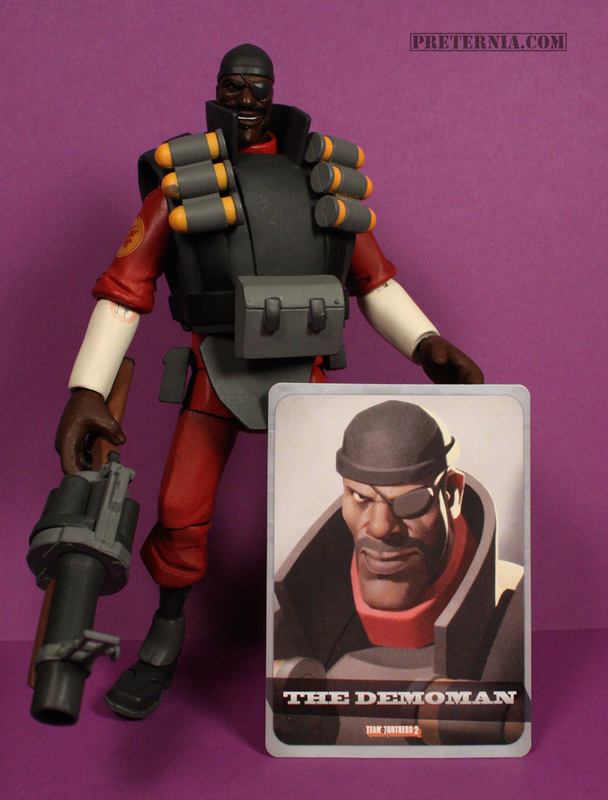 Let’s take a look at the Demoman. First thing to note is that this is an action figure, which usually means it has some type of “action” or ability to pose, articulation, play factor, etc. If you want a statue there are places to get them. NECA had an interesting task to accomplish by turning a very stylized look into an articulated action figure. The Team Fortress 2 cast makes this especially difficult because human anatomy is thrown out of the window. The Demoman has a great amount of articulation. He has the ability to get into a good amount of poses, especially game specific poses such as his taunts or firing animations. The figures appear to be made with the game poses in mind. The arms give you a great range of motion with joints at the shoulder, elbow, and wrist. This is also assisted by the inclusion of two extra left hands: open hand, closed hand, hand holding booze. His chest has an overlay for his vest which covers up the waist which seems to be a ball joint. I have noticed that the vest’s collar does block some of his neck movement, but it’s not too bad. The legs are great and have a ball joint at the hips, cut on the upper thigh, joint at the knees, and then a cut at the ankle. If you notice the art for these guys they all have very skinny ankles and feet. This is the part that makes it a little bit tough to get him into some good standing poses. The biggest problem is that he just doesn’t have a more solid base to get a center of gravity. I have had a little trouble keeping him standing since we received him yesterday. I wish he could stand better, but I imagine they were going for accuracy so making the feet bigger wouldn’t work. They could have made the feet a solid part without articulation but then that would limit the posing. I think it would be great if they released some stands for these guys since they do have holes in their feet, that would really help to get them in some great display poses. As far as accuracy is concerned you are getting the guy from the video game. This attention to detail is apparent when you lift the flap covering his crotch to expose a piece of paper with a smiley face taped over his groin. He comes with his grenade launcher, sticky launcher, and a hand holding his booze. It would be a cool opportunity to highlight the hat-based gameplay by maybe doing a hat add-on down the line. It would be very easy to stick a hat or afro right over his skull-cap. I’m sure if you have read up on these you will know it also comes with a game code, check out my article on what you will get with the Pyro and Demoman. I do want to touch on the paint a bit because I actually haven’t run into this issue with NECA figures in a while. My figure’s paint is fairly sloppy in areas. The all around package is fine and it looks like Demoman, but there are large gray smudges over the yellow parts of his shells. There are more scratches to the paint than I am used to. The red parts seem to chip pretty easily. I have also found the paint on the joints chip away as I pose him, that doesn’t bug me as much though after all its a moving part so it’s bound to happen. The only other weird thing I noticed is at his elbows if I put him in a pose where the white and red touch, the red will rub off on the white section. The paint on his face is great, they captured the Demoman look brilliantly. 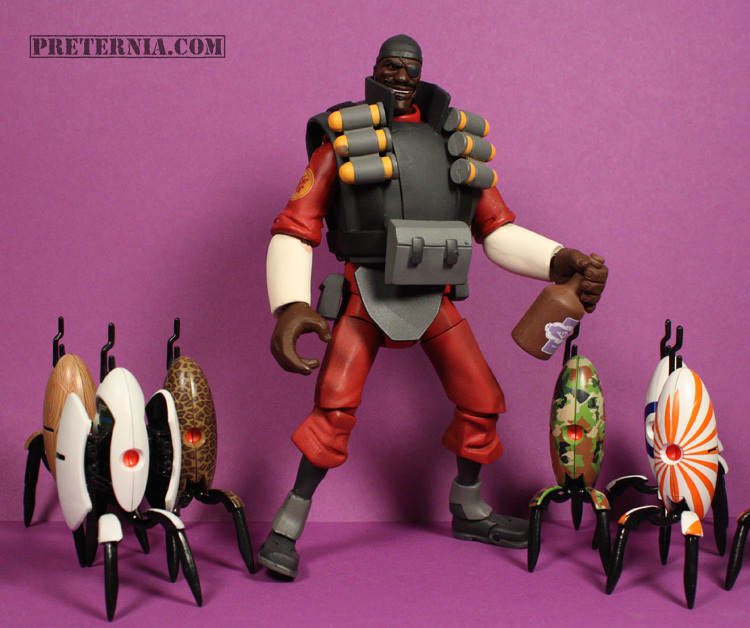 The TF2 figures from NECA will run you about $20 which is probably the best price for quality you are going to get in the market today. These figures are also limited and selling out really quick, I’d move in and order from your favorite place or grab him on Amazon before it’s too late. The Demoman is a perfect representation of the game character. I knew I would like him but I didn’t realize I would like him as much as I do. He has so many options and accessories, he looks just like the character, he’s super posable, and the cost is just right. Like I’ve said about every NECA Valve release, they bring it with every release. Hell even if you don’t play TF2 anymore (like me), these characters rock and having a shelf of them all is a dream come true. I only have the engineer… Sadly. I wonder when they will come within the sniper.